Summary: This research seeks to reassess stock structure among Florida green turtle rookeries and between the Florida nesting aggregation and those of the Caribbean using a new mitochondrial DNA short tandem repeat (mtSTR) marker system. Improved resolution has been achieved using expanded control region sequences, however, the Florida rookeries are dominated by two common haplotypes, CM-A1.1 and CM-A3.1. Moreover, CM-A3 accounts for the majority of nesting females at Tortuguero, Costa Rica as well as across southern Florida beaches. Preliminary data suggests that use of the mtSTR markers will improve our ability to identify demographically partitioned nesting populations along the Florida coast. We also anticipate stronger frequency differences between Florida rookeries and Tortuguero. Increased resolution will reduce uncertainty in rookery contribution estimates to mixed foraging aggregations. Results: Repeat (mtSTR) haplotypes were generated for 1,042 samples. 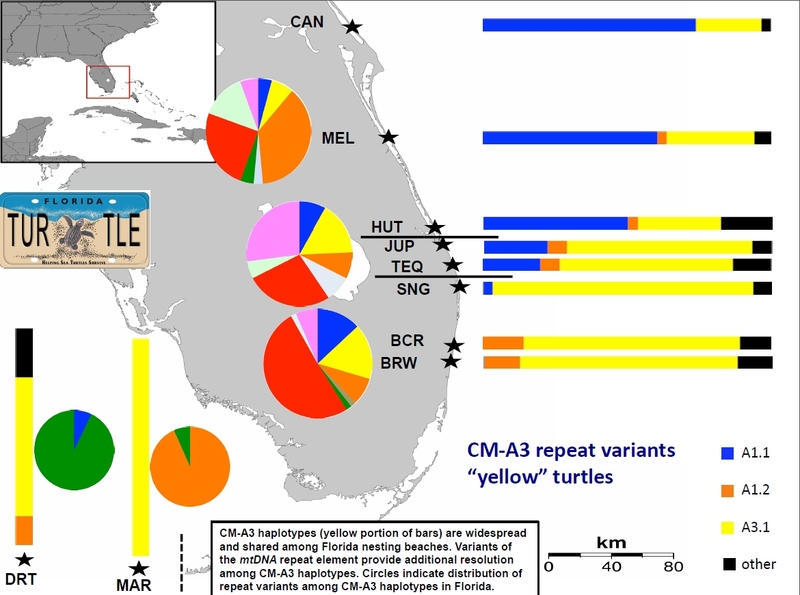 Based on these novel repeat haplotype data, it is clear that the Dry Tortugas and the Marquesas Keys rookeries are distinct from peninsular Florida nesting populations and each other. Repeat haplotype frequencies reinforced inferences from control region haplotypes indicating that central eastern Florida and southeastern Florida also represent distinct nesting populations. Treatment of Jupiter Island was not fully resolved. Based on control region haplotypes, it was previously considered to be either: 1) a distinct nesting population or 2) a transition zone hosting females from both the central eastern and southeastern nesting populations. Repeat haplotypes from Jupiter Island were shared with central eastern and southeastern rookeries, but the frequencies were significantly different from both. Moreover, repeat haplotype K accounted for 27% of sampled CM-A3 females in Jupiter Island but only 6% of central eastern females and % of southeastern females. This suggests that Jupiter Island may indeed host a unique nesting population rather than simply behaving as a transition zone. Additional sampling from St. Lucie, Martin, and Palm Beach counties is warranted to increase sample sizes and explore temporal variation in repeat haplotype frequencies.